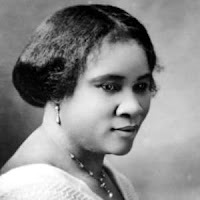 Sarah Breedlove Walker, Madam C.J Walker was a self-made millionaire. First female self-made millionaire in America - She made herself something great through marketing hair care and cosmetic products. This birth out of the trials she faced, through barely having enough to raise her daughter and was suffering from hair and skin problems. This was in a time where woman's rights and resources were limited. While being a washerwoman she mixed solutions together a found a cure for her scalp problems and started selling her products door to door. Inspiring entrepreneur - Sarah is an inspirational example of how to make the most of what you have by using your skills. She not only did it for herself she trained 20,000 women under her company by 1917. She became very involved in politics and pays for campaigns and offered scholarships for promising students. She used her wealth to make a difference in the world. Today we have all the opportunities to rise above and make something of ourselves. There is no limit! Sisters, be bold in your choices, stand for what you believe in and do what you are destined to. Rising above all the impossibility and stepping up to prove that you are a force to be reckoned with. A woman is more than just a homemaker, she's an all-rounder. Live out what you love. Be honest and be brave!